The most unexpected announcement at last week’s Apple media event was that of the 4th generation iPad; Apple broke its steady February-March release cycle of three years to shift to more business-friendly pre-Christmas holiday shopping cycle. The new tablet is essentially an iPad 3S considering the fact that it has received under-the-hood specifications bump without any updates in its somewhat chunky design. At the forefront of the specs bump is a new processor for which unofficial benchmarks are now showing up on the Internet. Check them out after the jump. The benchmark comes from straight from Primate Labs’ – the developers of the popular, cross-platform benchmarking tool Geekbench – internal database. With its dual-core A6X processor and quad-core graphics, the fourth-generation iPad (Score: 1757) easily lives up to Apple’s claim of it doubling in general performance as it smokes the third-generation iPad (Score: 791). According to detailed system information, the fourth-generation iPad’s A6X processor is clocked at 1.4GHz. This is a mere 100MHz jump over the iPhone 5 with its A6 processor. 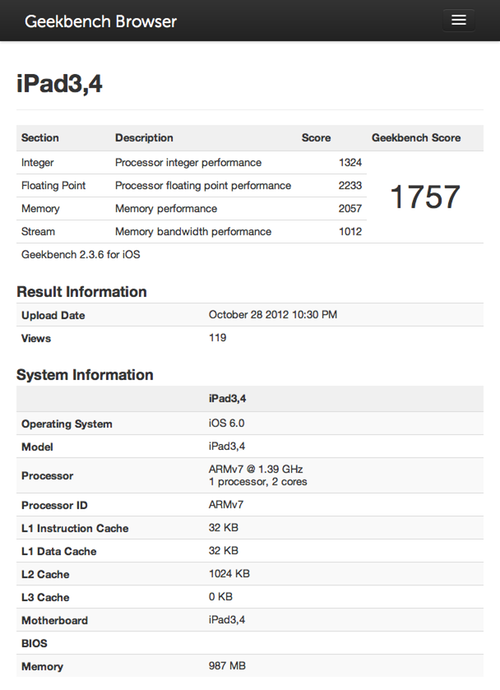 Don’t forget that when early benchmarks for the iPhone 5 were released, they showed the processor clocked at 1GHz. After further development of the Geekbench tool, it turned out that the processor was clocked at 1.3GHz, so it is entirely possible that the new iPad’s A6X chip may be even running at a higher clock speed. Besides this, the benchmark reveals the iPad’s memory to be 1GB which is the same as its predecessor. Although its capacity is the same, it may overall be running faster. Other than the new chip, the fourth-generation iPad comes with 720p FaceTime HD camera, the new Lightning connector that was introduced with the iPhone 5, and faster wireless connectivity. Pricing remains exactly the same as before with 16GB / 32GB / 64GB Wi-Fi-only models costing $499, $599, $699 respectively. For 4G LTE, Apple charges a $130 on top of each model. 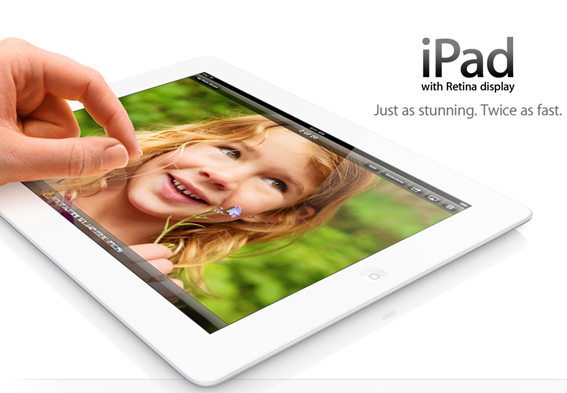 You can read the iPad 4’s features and specifications in detail in an earlier post. Those of you who pre-ordered a unit a few of days ago will get their unit on November 2nd. Ordering a unit now from Apple’s website will take more than a week to ship.